File photo of Shirley Eichenwald Maki and Kathy LaTour attending the conference that bears their names. The College will host a free public forum on health information management on Friday, Oct. 20, and will welcome alumni of one of its longest-running programs as part of the event. Health Informatics and Information Management is one of the fastest-growing occupations in the country, as health care organizations continue a shift toward electronic health records. St. Scholastica has taught classes in this field since long before records were computerized; its program started in 1935 and was the first in the nation. The College will celebrate with alumni during its 5th annual LaTour Eichenwald Forum on HIIM Leadership and Innovation next week. 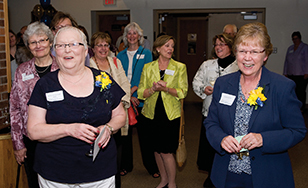 The event is named for former St. Scholastica faculty Kathleen LaTour and Shirley Eichenwald Maki. and Madonna LeBlanc, an assistant professor in the HIIM program at St. Scholastica. The panelists will discuss how their education at St. Scholastica prepared them for their career in HIIM, and how the industry has changed over the past 20 years. A variety of activities will be held on Saturday for attendees, including a breakfast, a guided tour on campus trails, and a painting session with On the Rocks studio. For more information, please contact Diana Wark at dwark@css.edu or (218) 723-6759.